Hulu, the web video powerhouse jointly owned by News Corp (Fox), GE (NBC/Universal) and Disney (ABC) brought in an estimated $100m in ad revenue last year. Rumor has it that’s not enough and the company will look to a subscription service to push its revenues higher. According to a Reuters report citing “sources familiar” and a bevy of chatter, the company is looking at both subscription and the expansion of its service to consumer devices including the Xbox platform and the iPad. The concept, if the rumors echoing for months, prove accurate, would have Hulu charging $9.95 a month for access to older catalog programming. It would be something like Netflix’ “Watch Now” service – only it would cut out the middle and be owned by the networks themselves through their stakes in the Hulu joint venture. Newer TV episodes would likely remain free. Since its debut, Hulu has been extremely successful at drawing audiences. In March, it drew upwards of 40m viewers and delivered more than 1.1billion hours of video (comScore data). 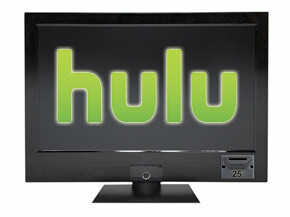 Any change to Hulu’s usage model isn’t likely to be changed without a lot of careful consideration. Hulu is not commenting on its plans at this point.